Millions of animals suffer from allergies, yet only a small fraction are ever properly diagnosed, tested, and treated. Requiring only a simple blood draw, help to protect your pet by allowing our doctors to test your canine and feline friends today! Allergy testing allows us to accurately identify offending allergens and point the way to a SAFE, NATURAL, and proven LONG-TERM SOLUTIONS. 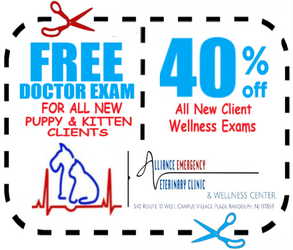 At Alliance Emergency Veterinary Clinic we offer canine and feline allergy testing. By executing these tests we can help to identify and protect your pet from regional allergens, food allergies, insects and mites, as well as molds, grasses, trees, weeds, grains, animal, and pollen irritants. Clients have the option to choose what allergen panels you want tested. Whether your pet is exposed to multiple geographical regions, is fickle when it comes to food, or your needs knowledge on all of the above, WE CAN HELP! 1) Begin with a Wellness Consultation -- This will allow our doctors to learn about your pet while our clients become familiar with the journey ahead. 2) Test and Protect Your Pet! -- All we need is a simple blood sample in order to learn the cause of your pet's distress. 3) End with a Genetic Lifestyle Consultation -- After our veterinarians have obtained results from your pet's allergen panels we will open up a dialogue with you about your pet's genetic results. Future care for your pet's allergies may include a specific vaccine engineered to treat your pet's unique needs, tactics to improve your pet's environment within their day-to-day life, and more!